Founded by five supervisors who had been fired from the Schatt & Morgan Cutlery Company which had been founded in 1897 in Gowanda , New York when the company purchased the Platts’ factory there, the company moved to Titusville in 1902, bringing men and materials with them to the new factory location. The two companies were in competition in Titusville for about eleven years until Queen City Cutlery was able to purchase Schatt & Morgan. The story of Queen City Cutlery is so woven from the threads of Schatt & Morgan Cutlery that one needs to know a little of that history also. John W. Schatt and Charles B. Morgan established the Schatt & Morgan Cutlery Company in 1895. Initially founded as the “New York Cutlery Company” (not to be confused with the well known New York Knife Company) the pair opened an office in New York City sometime in 1896. Some time in 1896 or early in 1897 they moved to Schatt’s hometown of Gowanda New York , and in July of 1897 they purchased the Platts’ cutlery plant there. (The Platts family then moved to Eldred Pennsylvania and on to various associations with the extended Case family.) The company was housed in Gowanda from 1897 until 1902 at which time they moved to the Titusville , Pennsylvania factory where they incorporated. Schatt & Morgan went bankrupt in the late 1920’s, and was sold to Queen City Cutlery in August of 1933 at a sheriff’s auction. The five supervisors who had been fired from Schatt & Morgan back in 1922 were able to return to the place where they had started. At that time C.B Morgan, former president of Schatt & Morgan ended up working for the very men he had previously dismissed. Since Queen Cutlery Company resides in that same Titusville factory to this day, so the story of Queen Cutlery Company really began with its predecessor, Schatt & Morgan. By 1903 Schatt & Morgan was manufacturing 40,000 dozen knives per year in Titusville and had twelve salesmen on the road with sales all around the country per newspaper reports of the day. Several building expansions were undertaken to keep up with production, beginning as early as 1907. In less than five years the company had doubled the size of their facility to keep up with an ever-increasing demand for their cutlery. The First World War altered the growth of Schatt & Morgan, due to the rationing of materials needed for the war effort, but primarily due to the short supply of skilled workers. The great influenza epidemic of 1918 also took its toll in Titusville and elsewhere. The company was further crippled by the 1922 firing of five of their most skilled workers, all supervising department heads. These were the men who in that same year would incorporate their own business: Queen City Cutlery Company. These department heads apparently had been making skeleton knives (knives without handle scales) on the sly since around 1918 and then wholesaling them out on their own. They were discovered in 1922 and promptly let go. The Schatt & Morgan work force subsequently dropped about thirty percent, or from about ninety to sixty workers that year, probably as a result of firing those supervisors. Those men, incorporated as Queen City Cutlery, moved about a mile away and began manufacturing cutlery themselves. Ironically, as noted above, on August 21, 1933 Queen was able to purchase the business and all its contents at a sheriff’s auction. The five men who founded Queen City Cutlery were Frank Foresther (1883-1939), Geza Revitzky (1880-1979), E. Clarence Erickson (1897-1961), Jesse F. Barker (1895-1970) and Harry L Matthews (1897-1967). Harry Matthews married Geza Revitzky’s daughter and their two sons were active in the business until 1975. Frank Foresther’s son, Louis, was also active in the company from 1939 until his death in 1956. Clarence Erickson’s daughter Eleanor married Walter Bell who became president in 1961 when his father-in-law died. Bell was president of the company in 1969 when it passed out of family hands and was purchased by Servotronics Corporation. Bell retired in 1972. As of the beginning of 2005, president of Queen Cutlery Company is Bob Breton. Retired master cutler and cutlery designer, Fred Sampson, still lives in Titusville and remains helpful in resolving some of the questions collectors have regarding Queen’s products over the years. It is important to note that Queen City Cutlery was an innovator and a pioneer in the use of functional stainless steel in pocket cutlery in America . (Stainless is defined as having at least 11% chromium in the alloy.) As early as 1926 Queen City Cutlery was listed in the regional trade publications as manufacturers of “High Grade Stainless Steel Cutlery.” Stainless steel had been introduced in England in 1914 and first patented in America in 1915, but the change in blade material was initially opposed by many cutlers as often happens when new technologies are introduced into an existing field. Queen was the primary innovator of this change from carbon steel to a stainless steel formulation that was well suited for blades and backsprings. Queen was the first American cutlery company to successfully introduce a large variety of stainless steel cutlery to the market. The first nickel-chromium steel produced in America was made in Titusville at the Cyclops Steel Company under the leadership of Cyclops’ chief metallurgist Charles Evans in 1917. Queen’s willingness to experiment and to push the limits of cutlery steel was also in evidence in 1999 when they began to use ATS-34 steel on master blades, and again in 2002 when they began using both D-2 and 420HC steels for blades. Queen used a wide variety of handle materials over the years; some of the most expensive and rare being “smoked pearl”. In addition to mother of pearl the company also has used various horn, bone, stag, and woods as well as numerous synthetic materials to haft their knives. Although Rogers jigged bone was used on many of their early knives, by the mid to late 1940’s Queen began producing most of their knives in Winterbottom bone. Winterbottom bone was originally produced in the Winterbottom factory in Egg Harbor , New Jersey , and from about 1950 to 1959 Queen used that style of jigged bone almost exclusively. Today Queen is well known for their use of Winterbottom bone and they continue to produce some of their knives with both bone and synthetic handles in that distinctive jigging style. Synthetic handles of plastic and nylon materials were used more and more beginning in the 1950’s and Queen began hafting most of their knives in synthetic Winterbottom style by 1959. 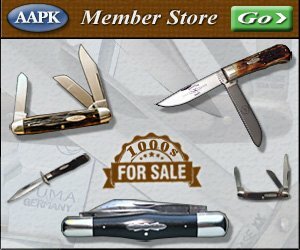 Overall the 1950’s and 1960’s were not good decades for traditional American cutlery as inexpensive Asian and European cutlery flooded the market while at the same time this country became less rural and more industrialized with less need for pocketknives for day-to-day cutting chores. Not only did Queen begin using Delrin Winterbottom and other less expensive synthetic handle materials, they also stopped tang stamping their knives around 1960 to further reduce production costs. Queen would resume tang stamping in 1972. From 1922 to 1955 Queen used approximately twenty different tang stamps. Collectors and users of cutlery as well as anyone with an interest in American manufacturing history can be grateful that Queen continues to manufacture all their pocketknives in the original Schatt & Morgan factory in Titusville . Quality cutlery is produced there today in essentially the same way as it was produced there over one hundred years ago; real bench made cutlery with a human touch. This company remains a remarkable constant in small scale American manufacturing and is the third oldest industry in Titusville . Readers may wish to know that Queen opened a factory store there in 1998 where one can purchase cutlery; and tours of the facility are given when factory planned events occur. All collectors should be grateful that the tradition of high quality cutlery manufacture continues at the Queen Cutlery Company.